You can manage (sort, label and delete) any of your save segments. 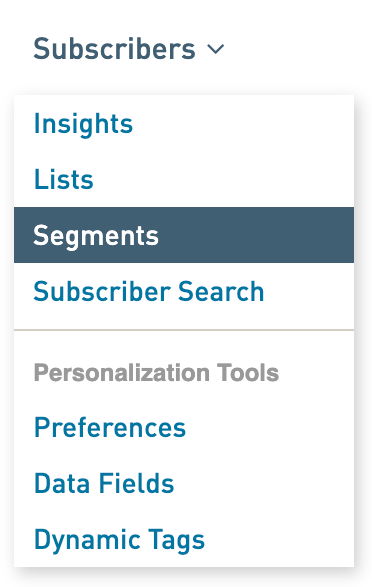 Segmentation is a tool in WordFly that allows you to send to just one portion of your subscriber list. You can create a series of conditional statements which segment out subscribers depending on the criteria you set. You can reuse segments in future campaigns as well. Create your segment and give it a name to save the customizations for a quick go-to the next time you would like to send to the same segment. Learn more about segmentation in our introduction post or how to manage any of your saved segments post. We'll review how to manage your saved segments in this article. Once you have saved a segment you can sort, search, label and delete segments in one location. It is not possible to edit a segment here, you can edit segments within a Campaign. 1. Go to Subscribers > Segments. 2. Your saved segments will all live here! Label segments by checking the segment’s box and using the gear dropdown to select a label to add. Use the search for finding a saved segment quickly. Use the Date dropdown to sort saved segments by past week, past month, past year or all. Use the Label dropdown to sort saved segments by a specific label.